A RPG for the PSP released in 2010. A sequel, Fate/Extra CCC, was released in 2013. Another sequel, Fate/EXTELLA, was released in 2016. An anime adaptation by Studio Shaft aired in winter 2018. 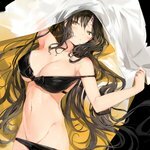 The following tags implicate this tag: fate/extra_ccc, fate/extella (learn more).